Oral History Interview - Robert H. Yancey Sr. 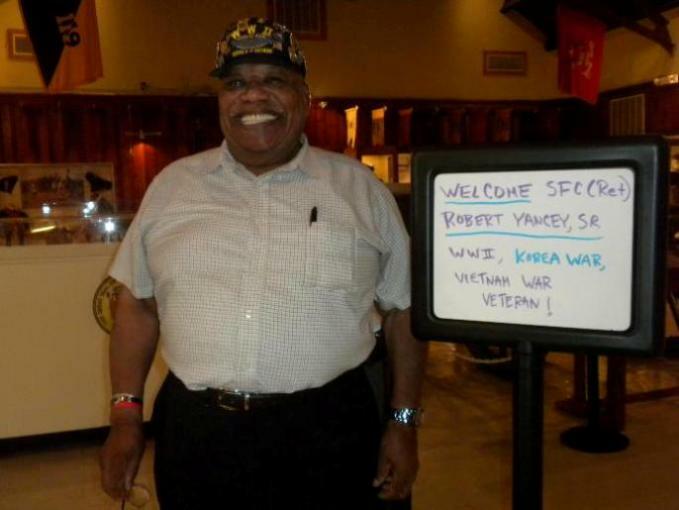 Veteran: SFC(Ret) Robert H. Yancey. Sr.
Robert Yancey Sr. was born in Philadelphia, Pennsylvania in August, 1925. While in high school Yancey had surgery on both of his eyes, which forced him to leave school at age sixteen. He went to work as a truckdriver, transporting fuel and coal. Yancey was drafted into the US Navy on October 4, 1943. He was one of five brothers, all of whom served in the military during World War II. All survived the conflict. The Navy was so short of men in 1943 that Yancey was not even sent to “boot camp” for basic training; he received all of his instruction aboard the ships he was assigned to. The first ship he was stationed on was the USS Alantina, where he served as a cook. In 1943, the only two jobs available to African-American sailors were those of cook or steward, the latter a waiter for the officers’ mess; although, cooks and stewards were often assigned additional duties. Yancey spent six months aboard the Alantina, training not only as a cook but as a member of a torpedo defense detachment. He was then transferred to Patrol Craft 1600, in Norfolk, VA. PC-1600 subsequently sailed to the Pacific, where the first action Yancey saw was an attack by Japanese kamikaze pilots. Although a cook, he was cross-trained and manned a battle station as an anti-aircraft gunner on the vessel’s top deck. Yancey’s ship was involved in the invasion of the Philippines at Leyte and Luzon. He recalled that he gained great respect for the Filipino guerrilla fighters; he believed that without their assistance the United States would have had a much tougher time defeating the Japanese on the islands. Yancey spent the remainder of the war in the Pacific, participating in an additional landing at Mindoro in the Philippines, and in the invasion of Okinawa, with a stop at New Guinea. At the close of the war, Yancey was sent to Puerto Rico, as part of CB (Construction Battalion) 1615. There he worked unloading ships and coordinating transport of ammunition to storage on the island of Saint Thomas, remaining in Puerto Rico until his discharge on December 31, 1947. Upon returning home to Philadelphia, Yancey joined the United States Navy Reserves. He had always liked the idea of being a police officer and decided to pursue that career, so he enrolled at the Institute of Criminology in Philadelphia, with the hope of eventually becoming a detective. Yancey graduated in 1950, but shortly after graduation he received a notice of readiness for a call back to active duty. Sergeant Yancey was sent to Pusan, Korea, where he was reassigned to the regiment’s Headquarters Company. The North Koreans continued to attack the Pusan Perimeter, while the Americans built up their forces in the late summer of 1950. The Twenty-fourth was later awarded the Republic of Korea Presidential Citation for its defense of the perimeter. Two members of the regiment were posthumously awarded the Medal of Honor. When the American army broke out of the Pusan Perimeter following the US Marine landing at Inchon, the Twenty-fifth Division was the spearhead of the army’s advance. The Twenty-fourth Regiment was often the division’s spearhead unit, launching reconnaissance missions into enemy territory. In late November, 1950, the Twenty-fourth moved towards the Yalu River in North Korea, and at the end of the month made initial contact with elements of the Chinese Communist army, which subsequently launched a massive attack over the North Korean border, tumbling the Americans southward. In the fighting that ensued, the Twenty-fourth lost more than a third of its men. Sergeant Yancey described fighting the Chinese and North Koreans as “complete chaos.” The Chinese were very good at infiltration and would often penetrate the American front lines and surround individual units. The mountainous terrain made holding a secure front line even more difficult. Moving supplies to the front was a long and dangerous process, and getting the wounded out to safety was equally difficult; each stretcher required six men to carry it, and was accompanied by four riflemen for protection. Front line units suffered heavy casualties and received constant replacements, but many of the new soldiers were unprepared for combat, because the Army, in desperate need of men, was shipping them overseas before they were adequately trained. Weather conditions in Korea added another degree of difficulty to the military mission. During the winter, daytime temperatures hovered around thirty degrees Fahrenheit, and at night would drop to thirty or forty degrees below zero. Some soldiers actually froze to death in their sleep. Yancey remembered that it was necessary to gather sticks, leaves or anything available to put under a tent in order to provide some insulation and reduce the chance of freezing. On one occasion, he developed such a bad case of frostbite on his feet that his boots needed to be cut off. The injury resulted in him being declared unfit for infantry duty, and today he receives a 100% disability for the chronic condition that developed as a result of the frostbite. In October 1951 the battered, bloodied Twenty-fourth Regiment was inactivated, and the survivors were withdrawn from Korea to Sasebo, Japan aboard a transport ship. Midway through the trip, the ship was caught in a typhoon and driven onto a coral reef, where it was stranded. The ship was taking on water fast and Yancey, the only soldier on board with naval experience and training in dealing with disasters at sea, acted quickly, organizing men to keep the ship afloat until help arrived. After three days, Navy rescue ships reached the vessel, rescued the passengers and crew and conveyed them to Sasebo. Tragedy again struck the men of the luckless Twenty-fourth on the way home from Japan, as a plane transporting some of them crashed into the Pacific. Yancey’s luck held, though; although he was supposed to be on board that aircraft, he had fortunately missed the flight. On returning to the United States, Sergeant Yancey was transferred from the infantry to the military police and stationed at Fort Benning, Georgia. Although desegregation of the military (initiated in 1948) was completed during the Korean War, racism continued, especially on bases in Southern states that still had legal civilian segregation. A major informed Sergeant Yancey that even though he was a military policeman, he was not authorized to stop or question white soldiers -- for any reason. Growing up in Philadelphia, Yancey had never experienced the level of racism that he encountered in Georgia. He recalled, however, that he would not let himself give into negativity and continued to do his job to the best of his ability. On one occasion, he broke up a fight between four soldiers, two of whom were white and two black. A civilian police officer ordered Yancey to hand over the soldiers; Yancey refused and took the men back to their barracks. The major had Yancey arrested for pulling his firearm on a civilian and threatened him with court-martial. After thirty days under house arrest, Yancey was able to tell his side of the story to the colonel in charge of the military police (provost marshal). The colonel expressed outrage at the major’s behavior and immediately released Yancey from arrest and returned him to duty. After his stint in Germany, Yancey returned to the United States and was assigned to an infantry basic training unit at Fort Sam Houston, Texas, as the only African-American noncommissioned officer in the outfit. His job was to train drafted conscientious objectors for noncombat duties. Again he was criticized for being too hard on his subordinates. Yancey, however, remembering his combat experience in Korea, maintained that “he was hard on them in order to train them to be ready for the harshest battle situations.” Yancey’s next assignment was to a medical unit attached to the 809th Engineer Battalion, which was building railroads in rural areas of Thailand. He subsequently served in Vietnam from 1967 to 1969 in the Medical Service Corps, where he was in charge of transporting patients from the battlefield to field hospitals in the Phu Tai Valley, near Qui Nhon. In his two years of duty in Vietnam, Yancey never lost a patient, and he was awarded the Bronze Star for his service there. Sergeant Yancey retired from the Army in 1971, settled in New Jersey and received degrees in Behavioral Psychology and History. After graduation he worked as a teacher at Trenton State Prison, instructing inmates in social studies, and later became State Coordinator for Behavioral Modification in the New Jersey prison system, where he worked for twenty years, attempting to inculcate life lessons he had learned himself in a long and distinguished military career. He remembered that the most important lessons he had learned, however, came from his father, which he summed up as to “always treat others the way you want to be treated, and to never give in to negativity.” He said that it was those simple rules that allowed him to deal with life itself and to overcome the racism that he had encountered along the way. After retiring from the prison system, Robert Yancey offered his services as a volunteer, performing the same job he had as an employee, for two or three days a week, which he continues. He told the interviewer that he believes it is a veteran’s duty to share his or her experiences with and teach younger generations. He is currently the State Commander of the Disabled American Veterans, and he strongly encourages all veterans to share their stories with others. On V-J Day 65 years ago, 20-year-old Robert Yancey -- an officers cook aboard the Patrol Craft 1600 submarine chaser -- was somewhere in the Pacific. Yancey, now 85, isn't sure of his exact location; most likely it was near the Yap Islands east of the Philippines. But in the heated, waning days of World War II, after the Allies had taken back the Philippines from Japan and were aggressively delivering a knockout punch, there wasn't time to get back to the journal he'd been keeping. A typhoon during the Battle of Okinawa didn't help either. From February 1945, as his ship was moving away from the Philippines and preparing to invade the island at the southern tip of Japan, to September -- when it was all over but the coming home -- there's a big gap in Yancey's yellowing journal. But it's still an amazing chronicle of the life of a sailor in the Pacific -- especially a black sailor at a time when American armed forces remained segregated. There were the famed Tuskegee Airmen and other highly decorated black combat units, but few opportunities were available for blacks at sea. "At that time, an African-American in the Navy could only be a cook or a steward," Yancey recalled. But he and other blacks -- Yancey was one of two on board PC 1600 -- were also trained to do battle during an ocean attack. His battle station was in the front of the ship, passing up ammo from the bilges. Born and raised in Philadelphia as one of 16 siblings, 18-year-old Yancey had dropped out of high school and was delivering fuel and coal when he was drafted in October 1943. "I didn't go to boot camp," Yancey remembered. "I got all my training on the ship." Ironically, he couldn't swim then -- and still can't. His first assignment was on the USS Atlantida, operating in the cold Atlantic off the coast of Maine. Sailors on board were being trained to use gear that was supposed to blow up torpedoes before they could hit their target. After six months on the Atlantida, Yancey left it on April 26, 1944, and headed to Norfolk, Va. He boarded PC 1600 on June 8. A newly converted minesweeper, PC 1600 was more than 173 feet long but only 23 feet wide, with a 3"/50 dual purpose mount, one 40mm and five 20mm guns, two depth-charge projectors, two depth-charge tracks and two rocket launchers. PC 1600 left Norfolk on June 9, with a stopover in New Orleans and a trip through the Panama Canal on the way to San Diego and Pearl Harbor. After spending August 1944 at Pearl Harbor, the ship set out on the Pacific to places unknown to Yancey. The stops turned out to include Eniwetok in the Marshall Islands; Palau in the Carolines, east of the Philippines; and nearby Yap, another of the Carolines in the western Pacific. The ship became part of Admiral William "Bull" Halsey's Fast Carrier Task Force as the vessels made their way to the Philippines. After 10 days at sea, the task force reached Leyte on Oct. 20. The Battle of Leyte Gulf -- considered the largest naval battle of the war and perhaps the largest in history -- began on Oct. 23. "The USS Missouri was as far from us as if you were crossing the street," Yancey said. "When they ran (Gen. Douglas) MacArthur out of the Philippines (in 1942), he vowed he would return. Well, he took me back with him." Leyte was also the first battle in which Japanese aircraft were seen in organized kamikaze attacks. "The Japanese would make suicide dives onto the ships," Yancey remembered. "During the invasion, they would come down between the ships so you couldn't shoot at them." Next, the task force headed toward Luzon in advance of the next invasion, on Jan. 9, 1945. Going ashore on Luzon, the sailors traded food, books, clothing and candy to the natives in exchange for Japanese money, chickens and coconuts. One of PC 1600's duties was to "mop up" -- meaning rounding up Japanese prisoners in the water and on the islands and transferring them to a larger ship. As the long Battle of Luzon continued on land, Yancey's ship and others also went on maneuvers preparing to invade Okinawa. It was during that battle -- from April to mid-June -- that word came of Allied victory in Europe. "We were overjoyed, knowing right well they would shift guys in Europe over to the Pacific, and pretty soon the war would be over," Yancey said. The Okinawa campaign was especially rough because there were two enemies -- the Japanese and nature. "We had a typhoon," Yancey said. "It capsized three destroyers that were low on fuel and flipped over, and we couldn't rescue those guys who went overboard. "The waves would carry you 50 to 60 feet in the air." Sailors were strapped to lifelines to stay afloat. In mid-August, the PC 1600 crew was at sea when an announcement came over the public address system. The Japanese had surrendered. "Everyone went wild," Yancey said. More mopping up of Japanese stragglers ensued. Even after the formal surrender was signed aboard the USS Missouri in Tokyo Bay on Sept. 2, PC 1600 stayed with the task force at sea, mainly searching for submarines. "A lot of Japanese didn't know the war was over," Yancey explained. "We stayed on patrol and never let our guard down." Finally, the ship got orders to head back to the states. Following stops at Palau, Guam, Eniwetok and Pearl Harbor -- after Yancey got to Oahu on Nov. 22, he wrote, "Baby! What a long trip!" -- PC 1600 arrived in San Francisco on Dec. 1. "When we got into San Francisco, we saw a huge sign that said, "Job well done. Welcome home,' " Yancey said. "The guys went wild again." Yancey said he had no problems to speak of with white troops on his ship. He chalks it up to advice his father gave him: "Treat people the way you want to be treated." After active duty, he stayed in the Navy Reserve from 1947 to 1950. When the Korean conflict broke out, Yancey joined the Army and was in Korea by September 1950. Although President Harry Truman had signed the executive order to integrate the armed services in 1948, implementation was slow. The Army maintained segregated units until 1951, and Yancey became one of the last "Buffalo soldiers," a member of the Army's all-black 24th Infantry Regiment. By the time he came home in 1953, however, his unit had been disbanded and its members integrated. Yancey moved to Florence, where he and his late wife, Grace, raised five children. He served in the Vietnam War before retiring from the Army in 1971, earned a high school diploma and went on to get degrees in history and school administration. He spent his education career with the New Jersey Department of Corrections. Now retired, he remains active in veterans affairs and enjoys reliving his war experiences and poring over his World War II journal and other accounts he kept of later campaigns. When Yancey finally had time to get back to his journal 65 years ago, it was Sept. 2 -- the day the Japanese formally surrendered in Tokyo Bay. This time, MacArthur didn't take Yancey, who was still at sea. He had no idea he would fight in more wars, and that other young men would still be at war today. On Sept. 2, Yancey was feeling all the optimism of youth. He'd survived, and he was going home. "The war is over, over there, and thank God for that," he wrote. "Now we have peace and I hope and pray that it won't be nothing but peace. I had enough of war, and I guess everyone else has, too." SPOTSWOOD — Seeing Colin Powell holding high office may make some Americans forget, but there was a time when black soldiers could not even fight alongside whites, let alone represent the American people. During a Feb. 28 presentation at Spotswood High School, students from the History Club got a firsthand account of the internal military war African-Americans once had to fight. The event was hosted by the club in honor of "Black History Month" and featured both black and white soldiers who fought during the Korean War, which was America’s first desegregated war. About 35 students listened to the veterans, who came dressed in their military uniforms. "We fought a two-pronged war," said Robert Yancey, an African American who spent his career in the military. "One war was for American freedom, and one for our own freedom." Yancey also spent time in World War II and Vietnam, and thus saw firsthand the progress blacks made in the military from the 1930s through the 1970s. During World War II, blacks were confined to their own regiments and were not allowed to fight alongside whites. "With every war we fought in, things got a little better," he said. "Our whole objective today was to carry on our legacy and remember the contributions that blacks have made to this great country," he said after his presentation. "Freedom is not free. Freedom comes with a price. The people we had here today are the people who paid that price." Yancey said he started his military career when he was drafted at age 18 to fight in World War II. A Navy man during World War II, he fought as part of the Army’s 24th Regiment during the Korean War. "I’m a Buffalo Soldier; it was an all-black regiment," he said. "It had black troops but white officers until 1951." During the Korean War, President Harry Truman desegregated the military, and the 24th infantry became part of the 14th, which had been all-white. By that time, however, Yancey’s term was up, and he had headed back to the States. Frank Yusko, a Spotswood High School history teacher and adviser to the History Club, said Truman’s desegregation of the military was very progressive for the time. "In many respects, the military was ahead of the loop," he said. "In 1947, Truman desegregated it, but that took a while to implement." He said the decision to desegregate was not a humanitarian move so much as it was an attempt to improve the American fighting machine. During World War II, the performance level of some all-black units was poor because they got the worst equipment and leaders, he said. "The only way to avoid that was to desegregate," Yusko said. He said the military’s main concern was simply winning wars, and its chances improved with desegregation. In addition, there was pressure from public figures like Eleanor Roosevelt, as well as the civil rights movement, which had been building for years even though many ignored it. "There was also pressure from certain politicians, particularly Northern ones," he said. Ironically, while the playing field was getting more level in the war zones, things at home were as repressive as always, Yancey said. That realization struck him as soon as he left Korea and was stationed in Georgia. "Thank God, you survived the war, but you came home to the prejudice," he said. "I experienced the old Southern mentality, which I wasn’t used to because I was born and raised in Philadelphia." "So when he stepped on the base, the stripes didn’t matter," Yusko said. Yancey said the bases in Georgia still had dual facilities so that blacks and whites would not be together, despite Truman’s edict. He said the extra facilities were expensive to keep though, which is what led to their finally becoming desegregated in the 1960s. Black soldiers made progress in the military because they showed they had as much fighting ability and responsibility as whites, he said. "They were great fighters, carried responsibility and proved themselves," Yancey said. "Therefore, they could not be denied."